Corporate donors like you support Ravinia's mission to help Ravinia build new and diverse audiences for classical music, sustain the incomparable Chicago Symphony Orchestra as we have for over 80 years, provide equitable access to music in classrooms through our Reach*Teach*Play® initiatives that serve 85,000 people each year, maintain affordable (or free) classical ticket prices for patrons, and help preserve the beauty of the park. Ticket sales cover about half of the festival’s annual operating costs, but for the rest we rely on our donors like you to make this all possible! When you become a Corporate Partner, you have access to exceptional music and entertainment with customized options. Additionally, your corporate name will be reaching an audience with a passion for the performing arts. With your commitment you will receive recognition and business-to-business visibility in the Chicago community. Review the levels of corporate support by clicking on the links in the menu below. Click The Values Below to Find the Right Contribution Level For You! ●Valid during preseason donor ticket request period. Due to increased demand, we cannot guarantee priority reserved seating at any level. • Reserved seats are filled and locations assigned based on the level of your support. • Within each level of contribution, seating is assigned according to the date your request is received by the box office. • Additional seating priority is given to members of the Silver Circle, who have contributed annually for 25 years or more. • For some concerts, the volume of requests from donors at higher levels is such that we cannot guarantee that all requests can be filled in their entirety. • Tickets are not guaranteed. While we do our best to accommodate all of our donors’ requests, due to demand that often exceeds the number of seats we have to sell, we cannot guarantee tickets at any level. Contributors at the Opus level and above have access to Ravinia’s VIP concierge service which provides extra assistance with dining reservations and ticketing through the concert season. 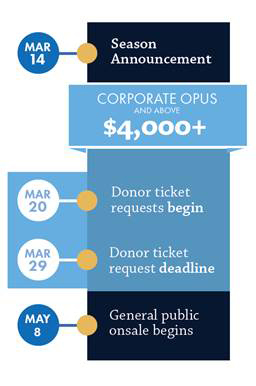 For more information on benefits offered to Ravinia’s valued Corporate Partners please contact corporatepartners@ravinia.org or (847) 266-5015. Mail or Fax: Click here to download a printable reply card to mail or fax your contribution. Phone: Please call the Corporate Relations Office at 847-266-5015 to make your contribution over the phone (Monday-Friday, 9:30 am – 5:30 pm Central Time). Stock: Click here for instructions on transferring securities electronically.